It's a fact of life: our health declines if we don't nourish our bodies every day with food and water. That's true physically. It's true spiritually as well. If we neglect to regularly feed our souls on the Holy Scriptures, our faith becomes weak and we start to lose touch with our Savior. Growth is stifled... if it happens at all. 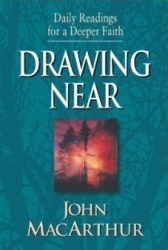 Drawing Near, used daily in combination with God's Holy Word, can not only help bring you closer to God but also keep you from spiritual stagnation. This book will guide you in a growing relationship with Him. As Pastor MacArthur says in his Introduction: "Our entertainment-conscious, quick-fix, fast-food society does everything it can to divert us from setting aside time to study God's Word. As you well know from your own efforts, Bible study is not often entertaining--it's hard work. It takes discipline to set aside time each day to reap the benefits such study has to offer. If you reach an impasse when it's time to sit down, open your Bible, and try to decide what to do, you're not alone. Without some plan to follow, it's easy to become frustrated and eventually give up after only one or two days. That's where this book comes in." If you desire greater understanding of the precious Word of God, if you want a daily guide to draw you closer to the Lord, this outstanding collections of 365 devotional readings by one of America's most respected and trusted Bible teachers is for you!